Just for fun, I thought I'd make a list of some of the crafts that I'd like to try one day! Some of them I've dabbled in before, some are crafts where I have a specific project in mind, some are crafts that I've been wanting to try for a while and others are completely new! A - Artist Trading Cards or ATCs - I've made these in the past and actually used to take part in postal swaps in the old days of Yahoo groups. If you aren't familiar with them they are small cards, sized for US baseball cards 64mm by 89mm. People turn them into miniature artworks, by drawing, painting, collage, textiles, all sorts creative things and then they are either kept or swapped. I'd like to have another go at making some. B - Bead weaving - My Mum recently bought me a bead loom from Tiger, it looks quite fun and simple to try out. C - Cake decorating - I am very envious of people that make beautiful cakes for their families, like the amazing Minecraft cake below that my friend Debbie made for Harry. I've never used fondant icing, it's really something that I need to try. D - Drawing - I used to be quite good at drawing back in the days of A-Level art, something I should definitely have another go at. 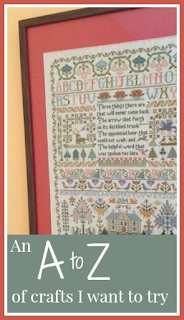 E - Embroidery - I enjoy cross stitch but I've never tried any sort of embroidery that is a bit more open ended or involves learning to do different stitches. I really love the free embroidery that people do on sewing machines. F - Felting - I'd been wanting to try needle felting for a while but I don't have the materials and to be honest I'm not really sure what I'd make, but I watched Kirstie Allsop doing it in her television programme once and I thought that it looked quite fun. G - Glass - I've tried and enjoyed simple glass painting but I love the idea of making a stained glass window using pieces of coloured glass. H - Hama beads - Of course regular readers will know that I'm quite prolific when it comes to crafting with Hama beads, but there are still lots of ways of using them that I'd like to try. In particular I'd like to try some 3D Hama bead creations. I - Ink - I've never really tried working with inks but I've seem some lovely ink drawings that I'd like to try. J - Jewellery making - I'd love to make myself some jewellery, perhaps a nice bracelet with lots of chunky beads on or some little earrings. K - Knitting - I've had some success with knitting but never really been that good at it. It would be nice to improve my skills a little bit and maybe learn some different stitches. L - Lampshade making - I'm not sure why lampshade making appeals, especially as we don't have many lamps in the house. I think I read an article once about a lampshade making course that inspired me. M - Mosaic making - I often mention my mosaic kit which is waiting to be finished. N - Nail art - As a teenager I used to love painting my nails, back when I had all that time to sit around and wait for them to dry. Things have moved on in the intervening years and there are all sorts of fun products around to make nail painting easier, as well as all sorts of tutorials and pictures to help with designs. O - Origami - I've tried before but never really got on with it as I'm not very good at following the written instructions. But YouTube has shown me that there are all sorts of video tutorials about that I might find easier to follow. P - Paper cutting - I love some of the detailed art work that you can make by cutting paper and mounting it on a contrasting coloured background. Q - Quilling - Quilling is a very cheap craft to try and doesn't need much in the way of special materials but it looks as though you can get very creative with it. I'm just not sure what I'd do with the finished pieces, I think I'd want to make something larger rather than lots of tiny things. R - Rag rug making - I started a rag rug many years ago but never got very far with it, now I have a little more patience I'd like to give it another go, just not sure I've got enough fabric! S - Scrapbooking - I'm not sure it's as popular as it used to be, but years ago I used to stalk Scrapbooking forums even though I've never actually tried it in the proper way. I do make various journals and my smash book, but not really anything with actual photographs in it. T - Typography - I'd like to have a go at calligraphy, and also try some of those lovely posters that have different words in to make up pictures and so on. U - Upcycling furniture - Nothing fancy, but maybe just painting some old bits of furniture that we have around to make them look a bit prettier. V - Violin - Not a craft exactly, but I have my old violin sitting around upstairs and I really need to get it out and play it again, I used to be quite good! W - Weaving - When I was little I remember making a little mat from weaving across a piece of cardboard and I really enjoyed it. A little while back I made a cardboard box loom for Harry and he loved it, we should do that again! 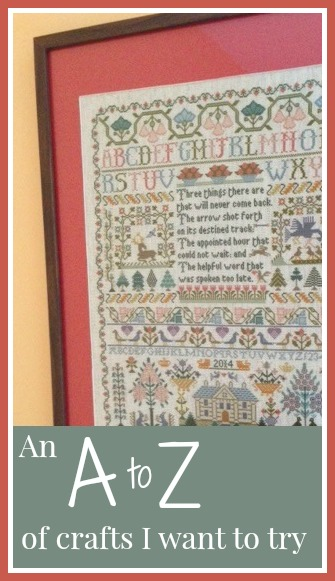 X - X stitch - I've done a fair bit of cross stitch in the past, like my vintage sampler, but one project that I'd really like to try is making up a family tree of my own design. It will be quite a big project though! Y - Yo Yo Quilt - A yo yo quilt is made using circles of fabric and I think that they look pretty cool, maybe one day I'll have enough fabric to make one! Z - Zips - I'd love to make some little zippered pouches for storing things or taking on holiday but I've no idea where to start with putting a zip in, I'm sure I could learn! Good luck with all these crafts, I hope you find time to try them. I do digital scrapbooking and love it as a method of sharing pictures and written memories on one or two pages. I don't produce as many pages as I'd like, but I keep working on it and some is better than none.